More on How Many Guns Are There in America Today? 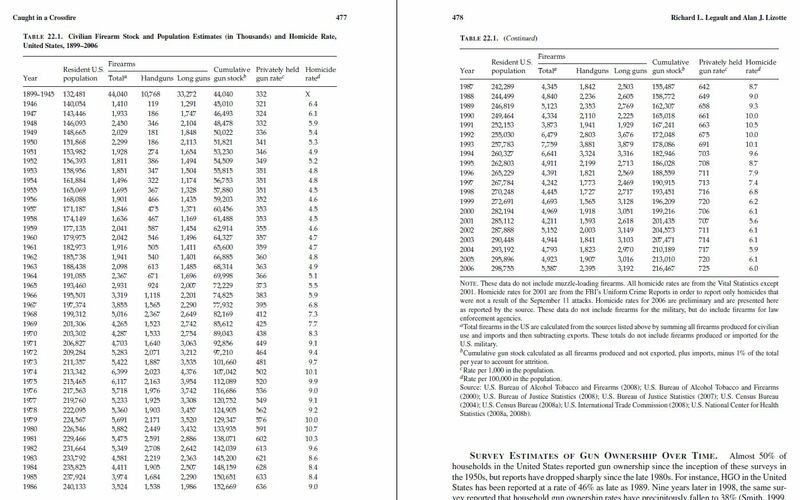 This suggests that since 2000, (at least) 252 million guns were ADDED to the U.S. gun stock. Hognose goes on to consider many caveats, but his basic point remains: How could there ONLY be 300 million guns in the United States if 252 million (at least) were added just in the last 15 years? In fact, his conservative estimate is that 329 million were added from 1999-2016. He then offers various guesstimates for the pre-1999 period to arrive at a low estimate of 412 million to 660 million guns in the US gunstock. The Weaponsman post is thoughtfully argued, but it also raises some questions. The site doesn’t contain a contact page and the comments are closed, but perhaps Hognose will see this post somehow and offer some further thoughts. If military and police firearms are not excluded from the A2K data, how much of the difference between the common estimate of 300 million and The Weaponsman estimate of 412-660 million is due to M&P firearms? Ignoring the fact that the A2K data does not seem to be public (only the summary statistic on the number of records seems to be), the sources that I drew upon in my previous post did use publicly available data and did show their work. 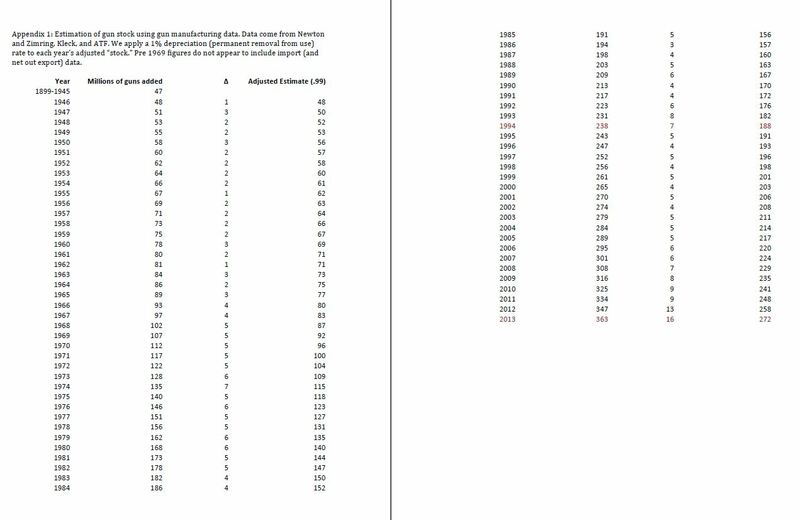 Using the round numbers given in the NFS paper for 1999-2013, 107 million guns were added. The 2016 Firearms Commerce report shows an addition 13 million guns manufactured or imported in 2014. Using that same estimate for 2015 and 2016, we get a total of (very approximately) 146 million new guns manufactured or imported according to the BAFTE data. Round that up to 150 million and there is still a 100 million difference between the BAFTE Firearms Commerce data and the BAFTE A2K data. So, my question is this: What accounts for this difference? In concluding I should note that although I am an “academic,” I have no interest in “trying to minimize the number of guns there are in America,” as Hognose accuses those who use the 300 million number of doing. My interest is in understanding reality. If there are 300 million guns in civilian hands in America, that’s good to know. Same if there are 400 million, 500 million, 600 million, or a billion. Also, I think most “anti-gunners” don’t use the 300 million number to minimize the number of guns but actually shudder in horror that there are that many guns in the United States. So I don’t think that can be taken as a motivation for these estimates by Legault and Lizotte or the National Firearms Survey paper. Tags: Alan Lizotte, Bureau of Alcohol Tobacco Firearms and Explosives, Data, Gun Ownership, National Firearms Survey, Richard Legault. Bookmark the permalink. Previous post ← How Many Guns Are There in America Today? A vibrant and growing Gun Culture 2.0, which is indicated by increased sales, anecdotal increases in the amount of first-time buyers, women, younger people, and minorities buying, and increased carry permit numbers is a threat to the anti-rights narrative that the actual numbers of gun owners is shrinking and thus gun rights are anachronistic and gun owner’s concerns can be ignored. It is a back-door way of subverting the political power of the NRA and other rights groups since, to date, teh anti-rights “groups” are primarily astro-turf funded by 1%-ers. I definitely agree that the question of how many new gun owners there are is a significant one. In my post tomorrow I provide at least some data for the existence of non-standard gun owners as a big part of Gun Culture 2.0. And the day after that hopefully my reflections on the question of surveys of gun ownership more generally. As I always say, stay tuned! The problem I see is an economic one. I bought all my guns back in the mid 1990’s For 3 milsup rifles, 4 pistols, 2 revolvers and one black powder reproduction revolver I paid not more than $3k. Just for curiosity I looked at MSRP on all these or the modern version if mine is no longer in production. To purchase my collection today would cost near $15K. If you add in the shotgun, black powder rifle and M1 Garand that were gifts from my father over the years the amount doubles largely because of the M1. Now lets be real here. Think someone on a Wal-Mart or McDonald’s level income can even begin to afford that? No. Not to get the exact guns. I doubt very seriously I will ever find a job with an income level allowing me to purchase a firearm ever again. The Constitution may guarantee your right to self defense but the market place will take it away. Keep your powder dry and your faith in God. Late to this party but I would like to point out the the gun control crowd has been using the 300 number for more than a decade. Part of the Alinski ideology is to minimize the opposition and rather than being upset over the number it is an attempt to downplay the popularity of gun ownership. The record breaking gun sales of the last eight years has been well reported in even the MSM so all have knowledge of the growing numbers. The other minimized number is the dreaded “high capacity ” magazine ( over 10 rounds ) which are bought at a ten to one ratio, and while they are more likely to be damaged or worn out than the gun it feeds, the field numbers could easily be over five billion. A number gun control cults and states like NY or CO turn a blind eye. Could just be the people I hang out with and read, but I never hear anyone on the gun control side say there are “only” 300 million guns in America.